A few weeks ago Tadas Viskanta asked a bunch of bloggers the following question: What ETF, if it were launched tomorrow, would you invest in with little (or no) hesitation? Said another way what asset class or strategy is not currently (effectively) available in an ETF wrapper? My answer: Nothing. I’m content. Little did I know that just a few weeks before he asked this, iShares came out with an interesting new set of “evolved” sector ETFs. One of the quirks with sector ETFs is that some stocks aren’t where you’d think. For instance, Amazon is in consumer discretionary (XLY), not tech (XLK). Visa is in tech (XLK) and not financials (XLF). Evolved sector ETFs right this wrong. 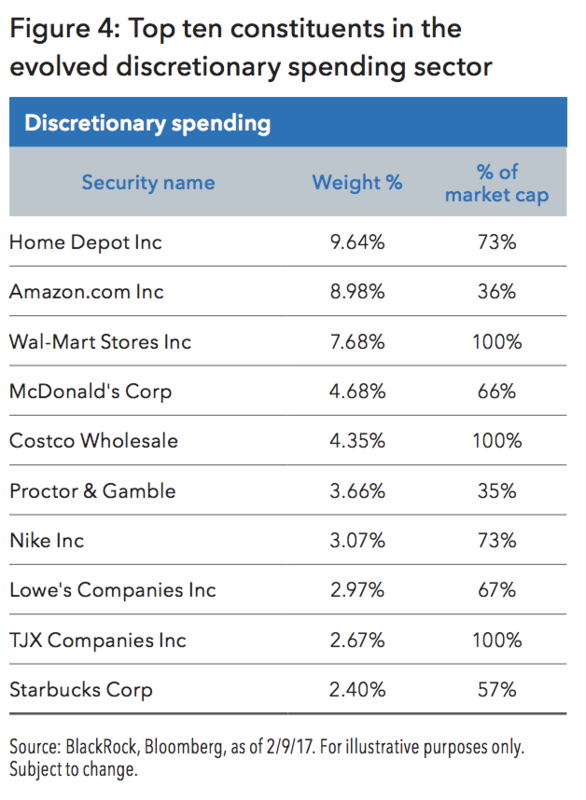 Below are the top ten holdings in the evolved discretionary spending sector. Amazon is the second biggest holding, with 36% of its market cap in this particular ETF (the other 64% is in tech). I don’t trade sector ETFs, but if I did, I’d take a long look at these. At a very reasonable 18 bps, they’re a more accurate reflection of the respective areas of the market. This is something that I didn’t know was missing until I saw it.